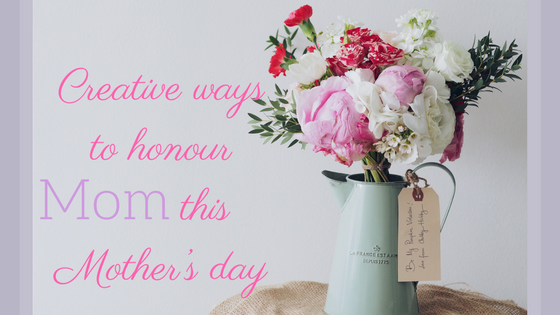 Creative Ways to Honour Mom on Mother's Day for those hopelessly wandering the store aisles the day before. With Mother’s Day right around the corner, don’t you think we should honour those women who gave so much and asked so little? As a mom, of four I sort of know what moms needs or even desire on a day such as mother’s day. These are simple ideas that won’t break the bank, show mom you care and your elbows will be free of glittery macaroni. So, if your hopelessly wandering the store aisles the day before, these are for you. Give Mom some quiet time: Try to plan something that will get everyone out of the house and give her some peace and quiet to do whatever she wants! She may take that time to catch up on things around the house without chaos going on around her. Run Her a Bath: Okay, so this one might actually require a little more work than it sounds if the tub needs to be cleaned, but she’s worth it! Add some nice bath salts or bubbly stuff, maybe light some candles or if you are really adventurous you could even make her some lavender body scrub. Let Her Sleep: Oh, sleep. That elusive thought to be a myth, wonderful, wonderful sleep! Why not give her a little bit of that for Mother’s Day? Let her sleep in, or take a nap if she wants! It’s definitely something most moms don’t get enough of, and it doesn’t cost a dime. Spend time with her. I mean it! Time is precious and if you are an adult, your mom has very limited time with you. Take her to a fancy tea room or go get a pedicure and just be together! Take her to lunch or make her a meal. Lots of places offer free lunch for mothers on Mothers day And if you don’t want to brave the crowds, order in. It doesn’t have to be fancy even pizza makes you happy when someone else makes it! Make her something meaningful. Now don’t get me wrong, I love me some Pinterest. Totally. Why reinvent what some other creative mind has already made easy? Just be careful not to miss the mark and bite off more than you can chew. How are you planning on honouring the women in your life this Mother’s Day? I actually bought my mom a gift certificate for an eco store, and they were offering free make-up consultations! My mom loved it! These are perfect things to do. Us moms certainly need all of the above. I had a nice day. I hope you did too. I hear this all the time. One of the best things people can do is to let Moms rest in peace and quiet. I guess that it is universal that moms are tired and need a serious break! A lie in followed by a cup of tea in bed while I gathered my thoughts would be my ultimate Mothers Day treat! I don’t think it will ever happen though! Letting her sleep would be the best gift. My mom tells me to recommend sleeping supplements for her and I have already given her melatonin and collagen with chamomile for a relaxing effect. I think these are enough for now. Every year I send my mom a big bouquet of flowers and also take her out for brunch. We order omelets and champagne and catch up on life. It’s a meal I really look forward to all year long! I’m always torn between wanting some “me” time and spending it with my family on mother’s day. I always end up doing a little of both! These are all wonderful ideas for my mom (and for me). I just hope my kiddos take time out of their busy schedules to celebrate their momma! I would love to have some quiet time to read and relax .. maybe even go to a bookstore to browse. I’m so glad I read this blog post because I always struggle with Mother’s Day. I can never find the right gift to properly show my appreciation for my Mother. It does’t help that she lives in another state. Thank you for the great ideas! These are all perfect and easy ways to give mom a little extra attention on Mother’s Day. For me, I am all about the “let her sleep!” Although now that my son is older, I do get to sleep in more often, but when he was little, I would have given anything for a few extra hours, even if it was just once a year! Love your list of ways to make Mom feel special. I would appreciate the opportunity to relax and sleep in a little longer. Gifts are nice, but this mama needs a break. The question is, what if you always make her a meal? How do you make it even more special? That would be my dilemma. I could never impress her. I second let her sleep!!! LOL! This list is exactly the kind of gifts I want for Mother’s Day! People do not realize how much just spending time with our moms means to them. It is really difficult to understand until you are a mom yourself. I love just spending the entire day with my mother on her day. My mom has requested dinner out with all her kids and grandkids so we are trying to set that up. For me, I just want to snuggle with my son and watch TV. These are some great Mother’s Day ideas! I’ll take a day of peace and quite and a good hot bath with some lavender salt. Happy Mother’s Day to all the moms! These tips are incredible! I especially like the quiet time, running a bath, and letting her sleep. I wish these suggestions were around when I was younger. I get my mom cozy pajamas each year. She goes nuts for pajamas! Well since I’m a mom I want all of those things! LOL! My mom just wants us all to be together! I love each and every one of these! Mother’s Day is such a treasured day and I certainly look forward to enjoying my time with my family. Even the simplest of things like quiet time and a bath make all the difference in the world! My mom lives in another state and sadly I won’t be with her to celebrate Mother’s Day. She would love anything on this list but I did make her a tote bag and sent it off early this week so did manage to do something! I wish I could be there with her but a Facetime will have to do.